This is a child’s story of delight in her mother’s laughter – her favorite sound. This is a story of the impact her mother’s illness with cancer made when it took away her favorite sound. 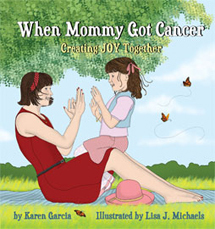 This is a child’s story of love, coping, and her search for lost laughter as the answer to the emotions and pain of cancer. This is a story of hope, discovery, and inspiration. This is a story of a mother’s love focused solely upon “being present,” and making each precious moment a treasure of memories to be translated into a legacy of JOY for the child she knows she must leave behind. A child teaches life’s lessons and their meaning. Karen Garcia, a beautiful actress and devoted mother, chronicled the diagnosis and survival of a terminal illness as the most significant segment of her forty-two year, nine-month life journey. Karen chose JOY. Karen lived her life as a surviving mother JOYfully. Karen wrote her own “script” – a celebration of her life – as a gift to her young daughter and as inspiration for all who search for and open their hearts to receive the gift of JOY. Lisa J. Michaels is a professional Illustrator with a gifted talent and warm sensitivity to portray emotions and feelings. Lisa artfully captures the array of intense emotions which are the reality of the subject; while presenting the pages as a flow of JOYous delight. Florida Authors & Publisher’s Assn. a source of strength in the search for answers to questions of why, what, and how when facing a diagnosis which carries time limits. a resource of reality for those who struggle and fight to hold on, for those who struggle to let go, and for those whose time it is to leave and those who are then lovingly left. a prescription and how-to for treading through the high grasses toward the calm of quiet pastures. a precious find, a little capsule of truth and hope, and a powerful expression of the essence and meaning of life - no matter the length of one’s stay. a “hold in your hands close to your heart” treasure of comfort.